About the Book: When she put her dreams on hold to help run the family ranch, she never imagined they would slip out of sight. Luckily for Stefanie, those dreams are about to come knocking at her door. 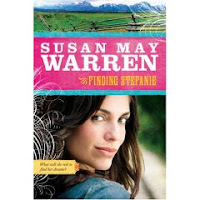 My Review: The first time I read a Susan May Warren book, a friend sent it to me with a little note..."don't read this book if you have a crush" She was right...Susan May Warren's books are so romantic! I love each and every one of them, and at the conclusion of each book, I think..."this one was better than the last!" I have loved the Noble legacy series. At first I thought there was no way I would enjoy a series about a ranch and rodeos, but Warren has a way of making this world not only accessible but almost appealing. She definitely makes those cowboys appealing! I am really sorry to see this series come to a close. While Rafe was my favorite of the heroes in these books, Stefanie was my favorite heroine. I felt like I could relate to some of her struggles as she looks to discover her meaning in life and if she is worthy of love and happiness. Stefanie battles feeling like she should be content because she has so many gifts in her life but still longs for more. But even more than that, I loved Stefanie's heart for the hurting and broken whether animals or people. I also really liked the secondary romance in this book. The novel deals heavily with redemption but also with perception, grace, and judgement. I loved that the pastor himself was not set up as the perfect character or a total villain but rather just another pilgrim on the journey. Too often I think books tend to take one extreme or another. This book is filled with the same romantic tension, gorgeous prose, and perfect pacing of all of Susan May Warren's books, but I suspect if you read it, it will also touch your heart and speak to the lonely dark places in you. Read an excerpt of Finding Stefanie. Visit Susan May Warren's website. This review is part of a blog tour! There's a really fun contest going on the details are below! 1. Which blogger is adopting a girl from China? The blog tour list can be found here. Sounds like a very sweet book! I hope you don't mind, but I added your blog to my blogroll. Love your reviews!